North Shore: "Heart & Soul"
designed to enhance any interior. To be sold via Auction to the highest bidder! This is an opportunity to buy a once in a lifetime gift for a Kim McDonald and Kai Lenny fan or yourself! What an amazing experience this has been to collaborate on artwork with one of my all-time favorite superstar athletes, Kai Lenny! I have known Kai since he was a young boy and watched him grow up to become a World Champion. He is truly an inspiration. Suitably motivated, I joined forces with Kai. I was inspired to develop a unique concept with my surfboard art, bringing the elements of his footprints and autograph, along with my design aesthetic, to life on a gorgeous aqua blue Gun Surfboard. The blue color represents the ocean, the green and white represent the movement in the waves of the sea. The Mālolo or “Flying Fish” is something that connects Kai to the Hawaiian waters of Maui. He often sees them, “flying” out of the water during his ocean adventures. It has always been a dream of mine to give back, get involved, do something impactful with my art, and this is my something. Join our team! Can you think of a better way to be part of the solution? The Pa`ia Youth & Cultural Center is a unique organization that builds community through our youth. This is our mission. While fulfilling our mission we provide a safe place emotionally and physically for the youth of Pa`ia and surrounding communities. We offer a variety of life skills focused activities- social, educational, cultural, vocational, and recreational that the kids LOVE! What we really value are the lifelong bonds created between our members. The purpose of our mission is to connect our members in friendships and working relationships that will become the foundations for our future community. Kim is a celebrated Maui artist, collected worldwide. She is well-known for her fine art depicting Polynesian women, island seascapes and surf culture. 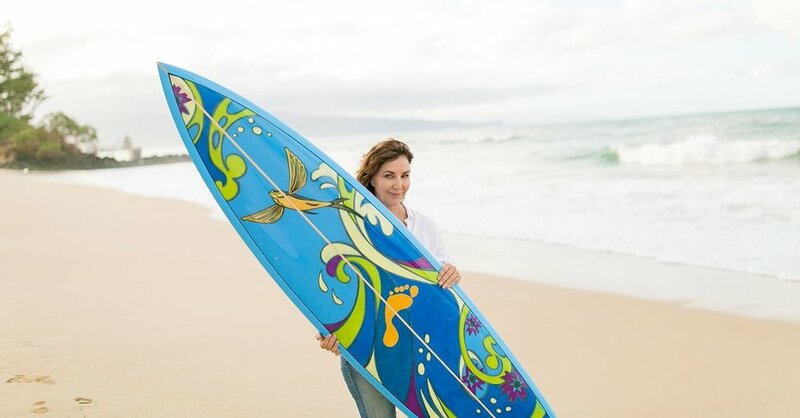 In recent years, Kim created an ocean-inspired line of designer surfboards celebrating the ocean life, primal geometries, and vivid colors of the sea. Our mission is to provide a safe place emotionally and physically for the youth of Pa'ia and surrounding communities which offers a variety of social, educational, cultural, vocational, and recreational activities.